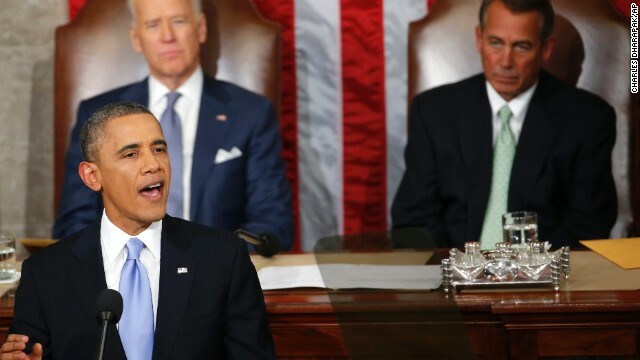 Get your daily scoop of what State of the Union is watching today, January 31, 2014. 1. From hope and change to... what? In his first interview since his State of the Union address, President Obama says he hasn't recalibrated his expectations or plans for governing the country after some contentious years with Congress. "In no way are my expectations diminished, or my ambitions diminished, but what is obviously true is we've got divided government right now, the President told CNN's Jake Tapper. "The House Republicans, in particular, have had difficulty rallying around any agenda, much less mine. And in that kind of environment, what I don't want is the American people to think that the only way for us to make big change is through legislation." Obama also said he believed Democrats and Republicans could come together to pass an immigration reform bill, and expressed concerns about the fallout from the criminalization of pot use. You can see the President's interview Sunday, plus reaction to his comments from Louisiana Republican Gov. Bobby Jindal on State of the Union. 2. Christie scandal development. The former Port Authority official who personally oversaw the lane closings on the George Washington Bridge is now saying New Jersey Gov. Chris Christie knew about the closings when they were happening and that there is evidence to prove it, according to a New York Times report. The Times cites a letter released by the lawyer for former Port Authority official David Wildstein, that described the order to close the lanes as "the Christie administration's order" and said "evidence exists as well tying Mr. Christie to having knowledge of the lane closures, during the period when the lanes were closed, contrary to what the governor stated publicly in a two-hour press conference" three weeks ago. “Mr. Wildstein contests the accuracy of various statements that the governor made about him, and he can prove the inaccuracy of some,” the letter also said. In his January 9th news conference, Christie denied knowledge about the planning of the lane closures and that he was told they occurred because of a traffic study. 3. House GOP: No "clean" debt bill. House Republicans say they will demand conditions for raising the nation's debt limit next month. Lawmakers at the House GOP's annual strategy retreat said because a clean debt bill would not get the support of the House Republican caucus, they'll push the White House and Senate Democrats to accept some sort of condition. But House Speaker John Boehner signaled his caucus wouldn't allow the nation to go into to default. "We believe that defaulting on our debt would be the wrong thing. We don't want to do that," said Boehner. At their retreat House GOP leaders also unveiled their principles for addressing immigration reform, saying there "will be no special path to citizenship," for the 11 million undocumented immigrants currently in the U.S.
4. Dem Govs. slam GA Gov. The Democratic Governors Association is out with a new web ad criticizing what it calls Georgia Republican Gov. Nathan Deal's lack of preparation and ineffectiveness in dealing with the winter storm that paralyzed the Metro Atlanta area this week. "Deal's failure to do his job put students, teachers, emergency responders, and working people at risk, said DGA Communications Director Danny Kanner. "No matter what he says now, Georgians won't soon forget his horrifying display of incompetence." Scores of drivers were trapped on icy highways and hundreds of children were stranded on buses and schools overnight when the storm hit Tuesday. Gov. Deal has apologized and says he accepts full responsibility for the state's response. 5. The Keystone pipeline. In a move that appears to open the door for President Obama's approval of Keystone XL oil pipeline, a State Department report has concluded that allowing hundreds of thousands of barrels of oil per day from Canada to the U.S. Gulf Coast would not have a significant negative impact on the environment. Environmental groups are vehemently opposed to the pipeline. Republicans and some Democrats have been urging the President to green-light the project to create jobs. "Mr. President, no more stalling – no more excuses. Please pick up that pen you've been talking so much about and make this happen. Americans need these jobs," Senate Republican leader Mitch McConnell said in a statement. White House Press Secretary Jay Carney said Obama has not made a final decision. 6. Super SOTU bonus scoop. As you prepare to watch the Denver Broncos and Seattle Seahawks battle in Sunday's Super Bowl XLVIII, a warning that you probably won't be watching as much football play as you think. A Wall Street Journal study of four recent NFL games found the average amount of time the ball is actually in play is about 11 minutes. About 60% of NFL telecasts are spent on shots of players in the huddle, standing at the line of scrimmage, or waiting between snaps of the ball. Throw in commercial time, and you've got a three-and-a-half to four-hour football broadcast. So there will be plenty of time during Sunday's game for you to go get in a bathroom break, or something, between plays. Team SOTU just wanted you to know.